You don’t need to resort to frying—or even baking—to make healthy crunchy snacks you’ll love. So many raw foods deliver the robust crunch you crave. What is so satisfying about crunchiness anyway? Mental Floss (MF) has the answer. In the article, The Science Behind Why We Crave Loud and Crunchy Foods, MF explores the art of the crunch, or as one researcher dubbed it, the “music of mastication.” Crunchiness brings a whole new sense—hearing—to the magic of eating. Listening to the sounds of our eating engages us even further in the process; the more noticeable the sound, the better the experience becomes. Crunches remind us to pay attention to our eating. 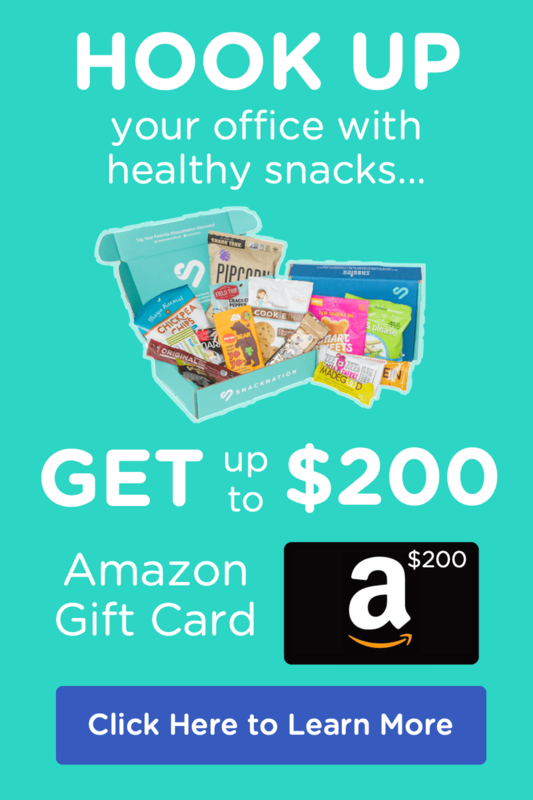 Since we love crunching so much, it’s important to find healthy ways to do it. That’s why we pulled together a roundup of healthy crunchy snack recipes you can make with wholesome raw foods that come delicious, natural crunch. 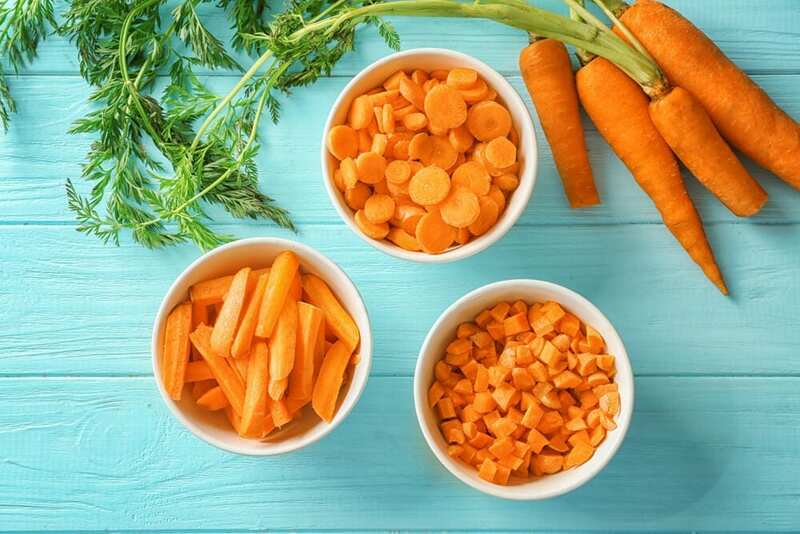 Carrots deliver a number of health benefits along with their characteristic crunch. They have few calories and a solid amount of fiber, and they have tons (334 % of your recommended daily value or DV) of vitamin A, which bolsters healthy vision and immune system function. Dip raw carrots in yogurt and sriracha. Spread almond butter onto raw carrot sticks. Drizzle olive oil and vinegar onto shaved carrots to make a bright orange salad. Pickle fresh carrots to have a crunchy, flavorful snack on hand at all times. Dip carrot rounds in fresh salsa to get a healthier version of chips and salsa. Believe it or not, there’s a science to the satisfying crunch that celery offers. 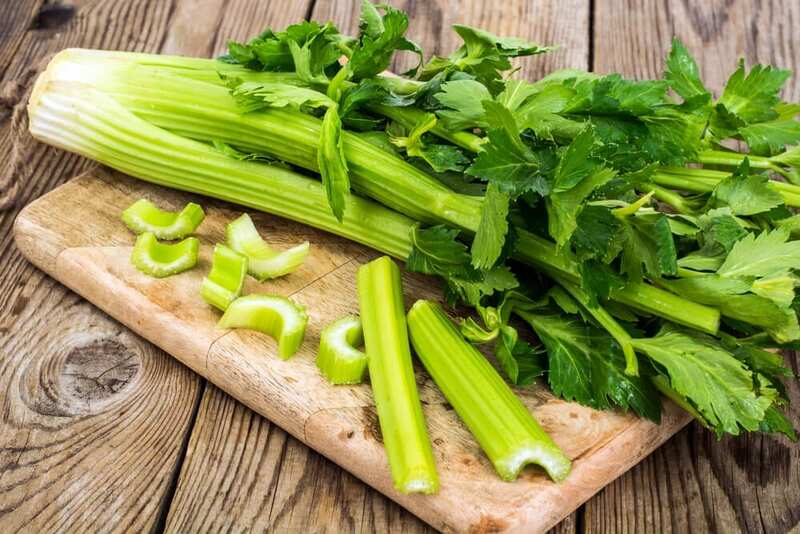 In addition to crunch, celery has vitamin C, vitamin A, and even some calcium. Celery also contains loads of antioxidants that protect your body from cell damage. Marinate celery stalks in a mix of sesame oil and sesame seeds. Use celery as an edible garnish for your favorite juice or smoothie. There’s nothing quite like taking the first bite of an apple. And with so many different shapes and varieties of apples to try, the sweet sound of your first crunch could be different every time. Apples have been most of humanity’s favorite fruit throughout much of history. Perhaps their crunchiness has something to do with their enviable position on top of our grocery lists. 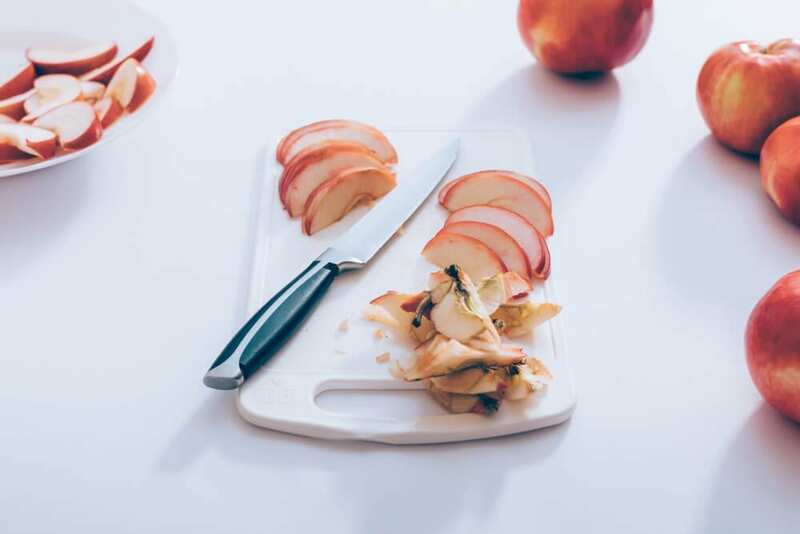 (It also helps that apples make us feel good, providing us with plenty of fiber and lots of vitamin C.) Since apples have lots of fiber and a high water content, they make us feel full and therefore fit nicely into any diet and weight-loss strategy. Give the ideas below a try, but never forget that a whole, raw apple delivers a good crunch and great taste. Make healthy raw apple donuts. Soak apple slices in juice. 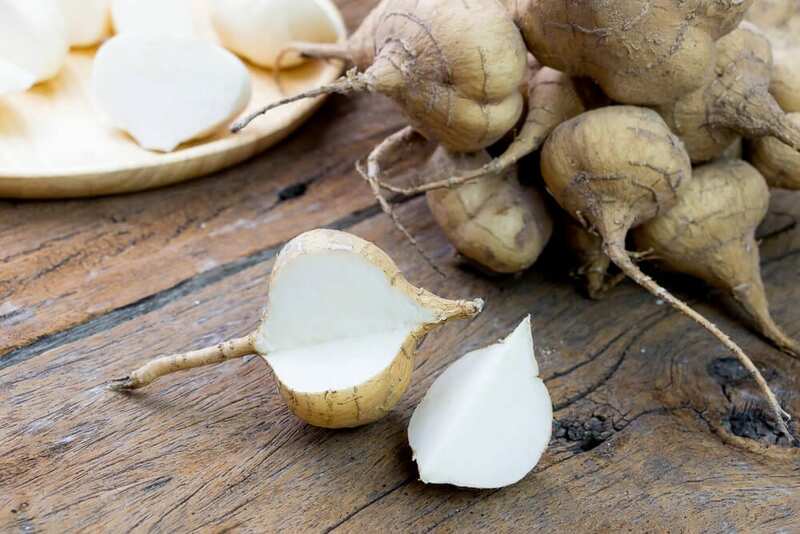 Sweet, starchy, and irresistibly crunchy jicama possesses remarkable snacking versatility. It has a mild flavor that tastes like a potato with just a hint of juicy apple. Jicama goes by many names, including “the Mexican potato, Mexican yam bean, ahipa, saa got, Chinese turnip, lo bok, and the Chinese potato. (In Ecuador and Peru the name “jicama” is used for the unrelated Yacón or Peruvian ground apple, a plant of the Sunflower family whose tubers are also used as food),” according to Foodreference.com. No matter what you decide to call it, jicama deserves a place in your snacking repertoire. Just 100 grams of jicama provides 20% of your DV of filling fiber. Dip jicama sticks in guacamole, salsa, hummus, and any other dip you want. Slice jicama into rounds. Top the rounds with black bean dip and a sprinkle of cheese. Make cilantro lime jicama fries with vegan chipotle mayo. Use jicama as a base for jicama-date canapes. Make a mini taco with black beans, avocado, and matchstick jicama. Get more snap peas in your snacking life by trying the recipes and ideas below. Eat a bowl of raw snap peas drizzled with smoked sesame oil and lime juice. Saute sugar snap peas with lemon. Eat snap peas in a salad. Put a few snap peas inside a mini pita pocket stuffed with hummus. 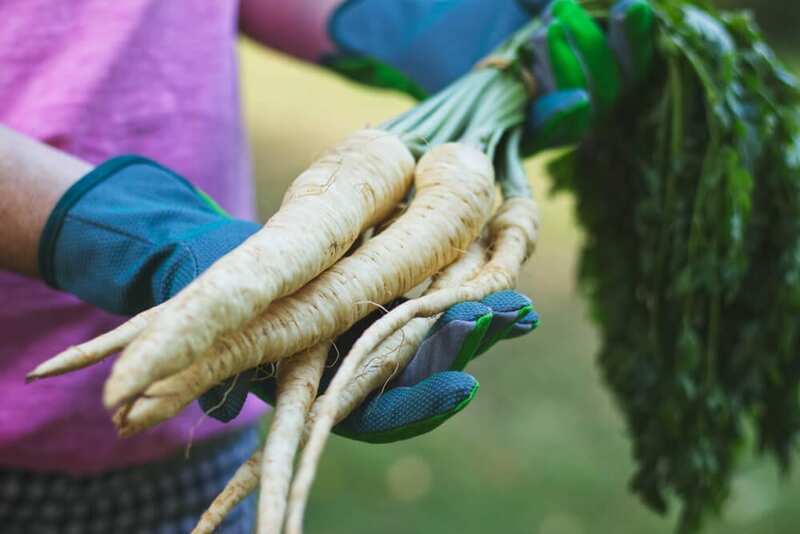 We don’t often hear buzz about parsnips, and to us, that means the world is missing out on a delicious and healthy snack. Parsnips have the same shape and crunchiness of a carrot, but they have a potato’s inviting color and starchy, slightly creamy texture. With plenty of natural sweetness and starch, parsnips taste much richer than they really are. A whole cup of parsnips has only 100 calories, and that serving also includes 28% of your DV of fiber and 14% of your DV of potassium. According to Organic Facts, parsnips may also boost heart health. The potassium parsnips contain widens blood vessels, which can ultimately relax blood pressure. And the folate in parsnips may reduce levels of homocysteine, an amino acid often linked to heart disease. Often diced and added to soups, stews, tacos, and other dishes, bell peppers soften when cooked. Many of us overlook them when we’re considering healthy crunchy snacks but in raw form, bell peppers of all colors have a juicy, sweet crunch. 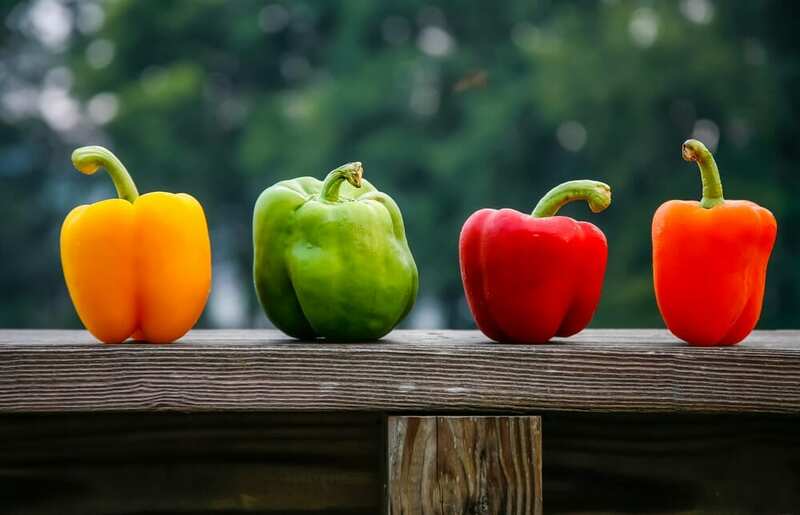 Bell peppers contain a long list of good-for-you ingredients, including vitamin C, vitamin K1, vitamin E, vitamin A, folate, potassium, and antioxidants. A key member of the cruciferous* vegetable family, broccoli has staple on our plates since we were kids. This green veggie has a satisfying crunch and loads of health benefits from its generous levels of vitamin C, potassium, fiber, protein, and iron. Eat raw broccoli with salt, lemon juice, and olive oil. Try raw broccoli with a hint of shaved Parmesan. Put a mix of raw broccoli, pumpkin seeds, and chipotle hot sauce into one half of an avocado. Like broccoli, cabbage belongs to the cruciferous family. This plant boasts incredibly strong stalks and thick, robust leaves. 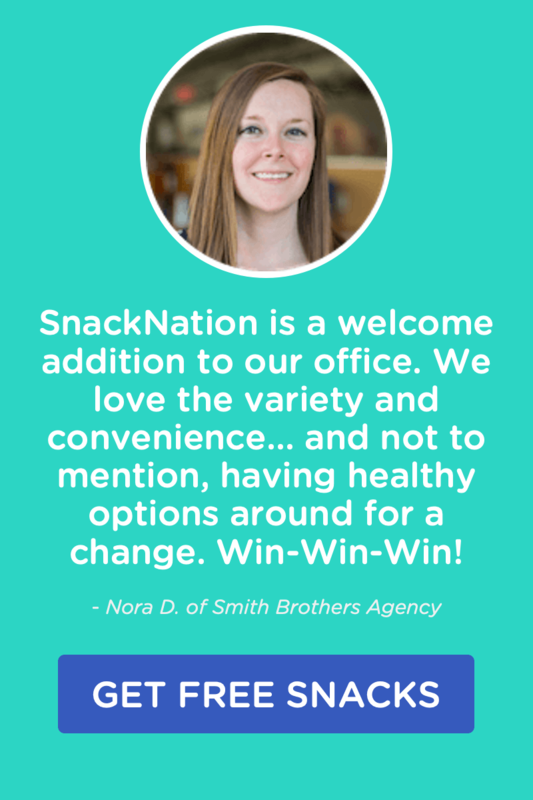 It produces a crunch that’s made for satisfying snacking. 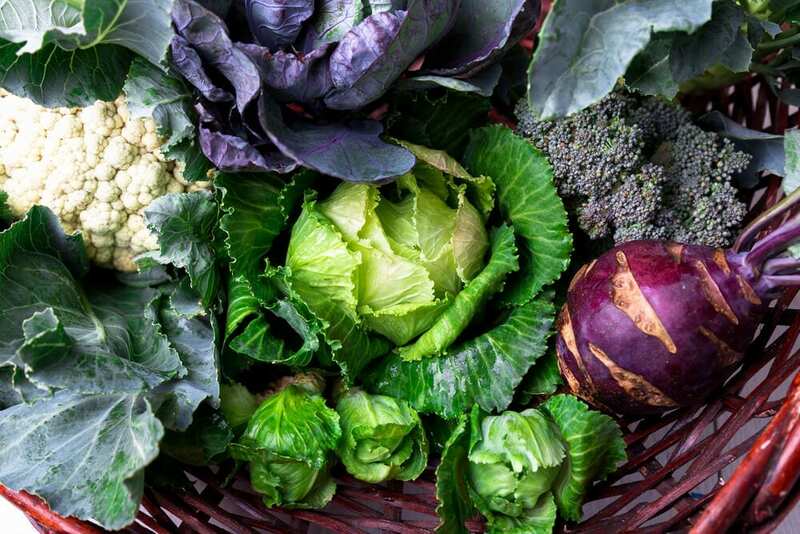 Cabbage offers a diverse list of benefits that include everything from warding off cancer to providing anti-aging beauty benefits. To use cabbage in your healthy crunchy snacks, we recommended passing on the wraps and tortillas and filling those crispy, crunchy leaves with delicious healthy ingredients. Roll thin sticks of carrots and cucumbers into a savoy cabbage leaf with the dip or condiment of your choice. Make raw cabbage sushi burritos. Make a sesame-lime detox salad. 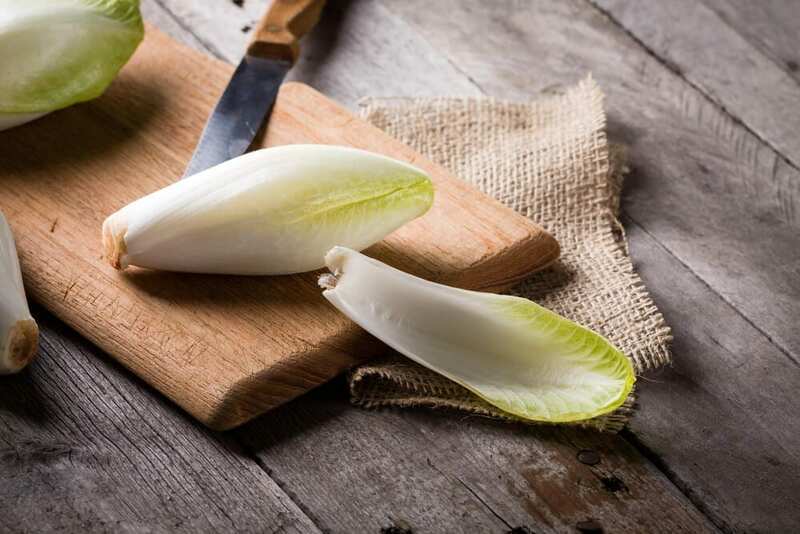 Endive’s small, robust leaves make perfect “boats.” You can put anything healthy in them to make a fast healthy snack. 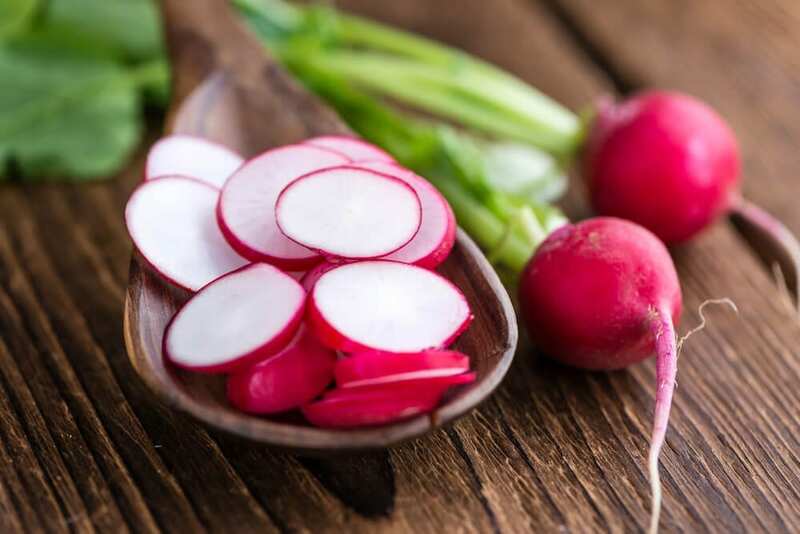 Radishes do more than add color to salads and restaurant plates; they can actually stand alone as a healthy crunchy snack. Radishes have crunch, flavor—a nuanced peppery flavor to boot—and lots of feel-good nutrients, including vitamin C and potassium. Slice radishes and serve them on crispy whole-wheat toast with avocado or tahini. Slice them into chips and snack on them with dilled yogurt. Stack radish slices with thinly sliced cucumber and tomato. A bunch of different nuts deliver a hearty crunch including almonds, hazelnuts, and pecans. 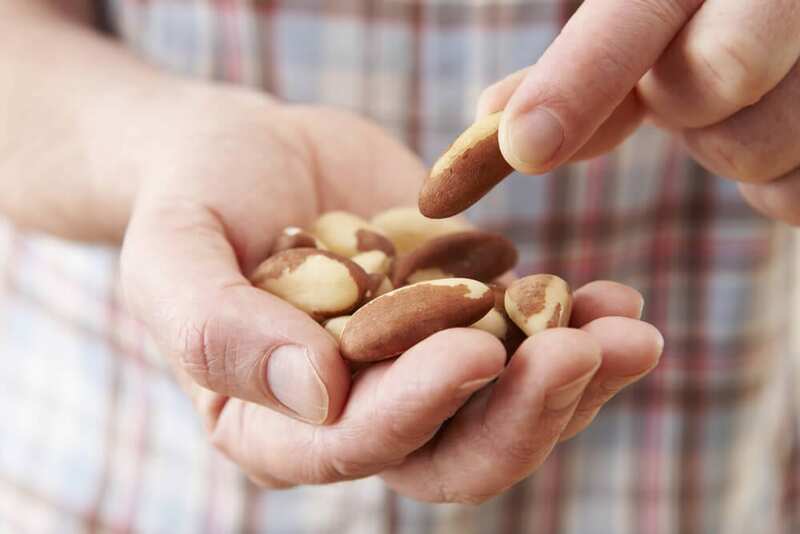 We’re choosing brazil nuts as the basis of some healthy crunchy snacks because they’re a larger nut that can be enjoyed in two bites, thus making for an even longer lasting crunchy snack. Plus, the selenium in Brazil nuts could improve thyroid function to help your body regulate hormone levels. For adults, the upper limit of selenium is 400 mcg. So you may want to limit your brazil nut portions to 1/2 ounce, or about about 3 nuts. Eat raw Brazil nuts as-is. Sprinkle them with cajun seasoning and bake them. Slice them in half lengthwise and add a dollop of your favorite sugar-free jam. Water chestnuts, Chinese water chestnuts to be precise, are not actually nuts; they’re corms. All that starch makes water chestnuts satisfyingly crunchy when they’re raw, and that means they’re the perfect ingredients for fast and easy healthy snacks. Add water chestnuts to salads to boost the crunch factor. 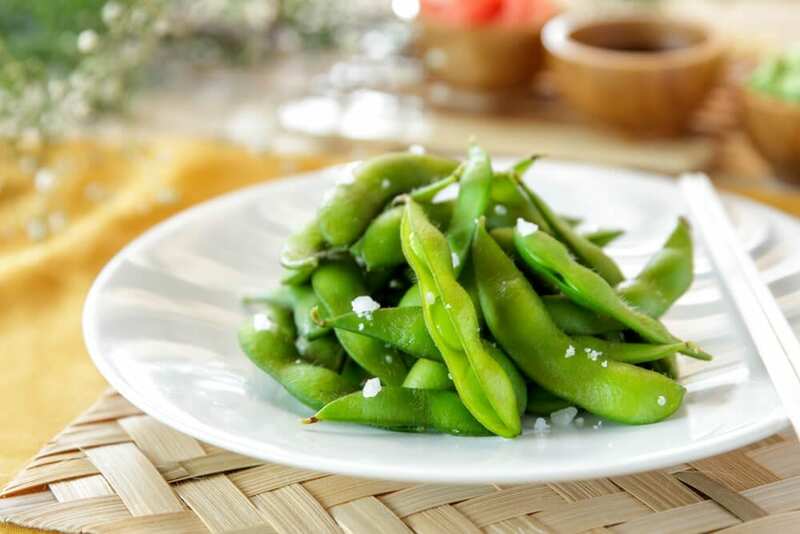 Delicious both in and out of the shell, edamame appears as a best-selling appetizer in sushi restaurants across the country. The snappy, sweet, and nutty soybean can become a full-flavored dish with just a little salt and some healthy steaming. Edamame has lots of plant-based protein, so it provides the perfect snack when you need something crunchy that’s also hearty and filling. You can prepare edamame in many different ways. Here are some of our favorite snack-friendly ideas. Mix with shallots and balsamic vinegar..
Bake edamame to make it even crunchier. Everyone likes a different kind of crunch. Some people enjoy a light and airy snap while others want something with a little bit of moisture. What kind of crunch do you crave? Let us know in the comments below.